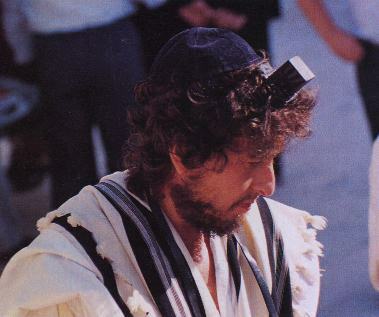 This web page is devoted to studying and collecting trivia relating to the Jewish religious/cultural odyssey of Shabtai Zisel ben Avraham v'Rachel Riva, a.k.a Bob Dylan. If you've been here recently, check out what's new. This page was last modified May 25, 2008. Changing his name from Zimmerman in the early '60s. Considering moving to a kibbutz in the early '70s. Converting to born-again Christianity in the late '70s. Studying with Lubavitch Hasidim in the early '80s. I wrote Bob Dylan: Tangled Up In Jews in 1991 for the Washington Jewish Week. Taking off from the then-just-published Clinton Heylin biography and the Bootleg Series boxed-set, it looks at Dylan's life and times through decidedly Jewish spectacles. In the coffee room of Powell's bookstore, three teenage boys with spiky hair and skateboards were reading Interview magazine and discussing the current music scene. The conversation turned to Robert Zimmerman, a.k.a. Bob Dylan. Said one: "I don't get why he changed his name from Zimmerman. All the coolest guys I know are named Zimmerman." His friend: "Yeah, when I grow up I'm gonna change my name to Zimmerman." Prophet Motive: Jokerman, Lubavitcher or lonely man of faith? Ronnie Schreiber took his camera with him on a recent pilgramage to Dylan's hometown of Hibbing. Check out the in-line JPGs (less than 100k total) of Dylan's childhood shul and his father's grave. Dylan was profoundly influenced by the sons of two great Yiddish writers. Here's a hint: One of the writers wrote the famous Yiddish novel "Before the Flood." A collection of anecdotes about Dylan, from first-hand, second-hand, and Internet sources. Contributions welcomed. Dylan has made several trips to Israel, some personal, some professional. Here are, so far, highlights from two of them. What fuels Dylan's muse? Could it be the sight of Israel with its back against the wall? For those of us who know Dylan's motto that "sometimes Satan comes a man of peace," that prospect may not be too surprising.... Take a look at Dylan's muse and Israel's wars and check out my speculation for yourself. Where is Dylan at these days? Is he Jewish? Is he Christian? Can the answer be blowing through his tour dates and set lists? The First Annual Bob Dylan Ceremonial New Year's Bread Toss, in which Bob's rabbi shares where it's at, and the man himself blows the Jewish horn. Talkin' Hava Nagilah Blues: The history of the Hebrew folk song that Dylan parodied at the start of his career. Was Dylan singing about things Jewish? A collection of Dylan lyrics amenable to Jewish interpretations. Who is the Jokerman? We claim Jesus is not the answer. (We also provide a non-tabular version for people whose Web browsers can't handle tables. Martin Grossman has an intriguing interpretation of I and I. Several Dylan songs have been translated into Hebrew. I've translated the first two stanzas of All Along the Watchtower. Israeli folk singer Yonatan Gefen (father of current pop star Aviv Gefen) translated several songs, including Girl from the North Country and Blowin' in the Wind. Mark Miller has translated Farewell Angelina. Shlomi Shaban has translated (and performed) Mama You've Been On My Mind. If you can help me with my collection of Hebrew versions of Dylan, please let me know! Tangled Up in Black. is a parody I wrote for the Purim holiday a few years back. Recommended for those with some knowledge of Jewish life. Neither Dylan nor Sony Corp. bear any responsibility for its contents. I Dreamed I Saw Maimonides is less hilarious, and probably owes more than it should to Bruce Springsteen. Alan Zoldan has contributed his "Apocalyptic Dream," to the tune of "When I Paint My Masterpiece" -- with a little of New Morning mish-moshed in, as well as a take on Something There is About You for the Shavuot holiday. What fuels my muse? A letter to a reporter answering questions about the motivations behind this Web page. Our readers write! Selections from letters to the editor of Tangled Up in Jews. Tikkun Magazine has an article entitled Both Sides of Bob Dylan: Public Memory, the Sixties, and the Politics of Meaning which I strongly disagree with, as both a Dylanologist and a Jew, but you can judge for yourself. Sony Corp. official Bob Dylan site. Karl Erik Anderson's "Expecting Rain" page. Ben Taylor's Ragged Clown home page. John Howells' Bringing it All Back Home Page Dylan page. Tim Dixon's page features beautiful pictures and Voyage CDLink technology to play your Dylan CDs. Bread Crumb Sins offers photos, interviews and an Italian section. A searchable database from the HWY-61 mailing list. John Underwood's Peter Himmelman page. Bird on a Wire: The Leonard Cohen Home Page features an in-depth interview concerning Cohen's Jewish identity. Visit my home page, read my resume or send me mail. Added Hebrew translation of Mama You've Been on My Mind. Thank you, Michael Weinstock! Added Hebrew translation of Farewell Angelina. Thank you, Marc Miller! Added new anecdote to Anecdotes Page: Dylan davening in '89,'94, and '01. Mark Landis unearthed Rolling Stone's account of Bob Dylan's 1974 Rosh Hashana celebration. Ronnie Schreiber discovered Rabbi Samson Raphael Hirsch's influence on Dylan's Grammy acceptance speech. Tangled Up in Jews rated top entertainment site by I-Way 500!?! Alan Zoldan has contributed a take on Something There is About You for the Shavuot holiday. Added the lines overheard in Powell's to this page. A look at Dylan's recent tour dates and setlists with an eye toward answering the question: Is he or isn't he? Ronnie Schreiber's Hibbing photo album: In-line JPGs (less than 100k total) of Dylan's childhood shul and his father's grave. Hebrew translations of Girl from the North Country and Blowin' in the Wind. A letter to a reporter answering questions about the motivations behind this Web page. Another anecdote on Dylan as a guest, and one on Purim with Dylan in Crown Heights.